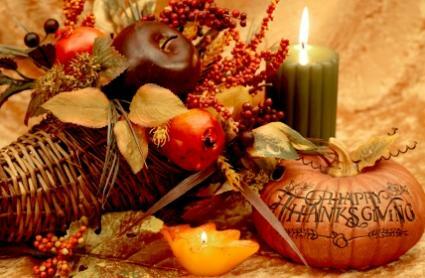 Are you trying to find the right invitation wording for a Thanksgiving fundraiser? Choosing thoughtful sentiments for your invitation can play an important role in securing guests as well as donations. The type of event you are hosting will impact how the invitation should be worded. In the spirit of Thanksgiving, we're hosting a customer appreciation day. Stop by our office on [insert date] from [insert time frame] and let us show you just how much we appreciate your business. We'll have tasty treats and beverages, a DJ, door prizes and more. We're also collecting canned goods in support of [name of organization]'s Thanksgiving food drive during the event and throughout the week. Bring three cans and receive a coupon for $10 off your next purchase of $50 or more. Additionally, 10% of profits for sales on customer appreciation day will be donated to [name of same organization food is being collected for] to purchase food. We hope to see you on [insert date of customer appreciation event]. You can make a difference! [Insert name of organization] does amazing work meeting the nutritional needs of people in our community who do not have the means to do so themselves. At [insert name of company], we're committed to doing our part and have pledged to donate [insert dollar amount] this Thanksgiving season in support of their efforts. Won't you help too? We're collecting canned goods and cash donations for [insert organization name] at our [insert type of business] from [insert start date] through [insert end date] from [insert hours and days of the week donations are accepted]. We invite you to stop by and share in the spirit of the season. All donations are welcome and appreciated. Every can and dollar make a difference! This month's meeting will focus on Thanksgiving and gratitude. Join your fellow [insert organization's name] members for a traditional Thanksgiving meal on [insert date] at [insert time]. Our speaker, [insert name of speaker], will discuss [insert topic]. We're also collecting canned goods and donations for [insert name of organization]'s Thanksgiving food drive. Bring three cans of food or donate $10 or more and receive an entry for a special door prize drawing! RSVP required - call [insert phone number] or register online at [insert URL]. Join your co-workers on [insert date and time] for our annual Thanksgiving Potluck on [insert date] from [insert time] at [insert location (break room, conference room, etc]. Turkey, dressing, ham and iced tea will be provided. Please bring your favorite Thanksgiving salad, side or dessert to share with your co-workers. We're also collecting food for [insert name of organization]'s Thanksgiving food drive on the day of the potluck. Please consider bringing a few cans of food to share in the spirit of the season. Our goal is [insert number of cans], which will help [insert name of organization] provide meals to needy families throughout the local community. Want a chance to win a terrific Thanksgiving gift basket while also helping those in our community who are less fortunate? [Insert name of organization or group] has assembled a gift basket packed with seasonal treats, from [insert examples of what is included in the basket], all donated by area merchants. We're selling raffle tickets to raise money for [insert name of charitable organization] for just [insert price] each! The more you purchase, the greater your chance of winning - and the money will go to such a good cause! Please buy a ticket today. The drawing will be held on [insert date and time] and the winner will be notified by email and/or phone! Please participate! You're invited to join [insert name of sponsoring group or organization] to gather in the spirit of Thanksgiving to celebrate a traditional meal while also raising funds to support a good cause. This year, [insert name of sponsoring group or organization] Thanksgiving Dinner and Silent Auction will benefit [insert name of organization for which funds are being raised]. The evening will feature a turkey dinner with all the trimmings and a silent auction. RSVP to [insert RSVP contact and methods] by [insert date] to reserve your seat. Cost: [price per person, price per couple, price per table]. Looking for a fun way to give thanks with your friends and family while also helping a charitable organization focused on doing good work right here in our community? Purchase your tickets to the [insert name of sponsoring group or organization]'s annual Thanksgiving Drawdown fundraiser on [insert date] from [insert time] at [insert location]. We'll enjoy an evening of great food, music, dancing, door prizes and a drawdown-style raffle. The grand prize is [insert grand prize description]! Win, lose or draw - this is a great way to kick off the holiday season! Purchase your tickets today and make plans to attend! Tickets cost just [insert price] and are available from [insert places to get tickets]. Won't you please help [insert name of sponsoring group or organization] raise funds to support [insert name of organization for which funds are being raised] by sponsoring our annual [insert name of Thanksgiving fundraiser event]? This year's event will be held on [insert date] at [insert time]. [Include a brief description of the event]. With your help, our goal is to raise [insert dollar amount] for [insert name of organization for which funds are being raised] to support their efforts to [insert what they do]. As a sponsor, your name will be listed on all promotional materials as well as the event's website. You'll also receive between two and eight tickets to attend the event, depending on your level of sponsorship. See complete details at [insert web address]. Please complete the sponsorship commitment on the website or contact us at [insert alternate contact information] to learn more. Thanksgiving is the perfect time to help fight the problem of hunger right here in our community. You can make a difference! Help raise awareness of how hunger impacts our community by participating in the [insert name of the sponsoring organization] 5K & 1-Mile Fun Run Turkey Trot to Fight Hunger. Proceeds will be used to support our efforts to combat hunger right here at home. Register today! Participants who sign up prior to the registration deadline will receive a Turkey Trot t-shirt. Want to spruce up your home for Thanksgiving while helping raise money to support a good cause? Come out for our DIY fall wreath-making class on [insert date] from [insert time] at [insert location]. Your class fee of [insert amount] will cover materials to make two wreaths and hands-on instruction from a professional florist. You'll make two wreaths - one will go home with you and the other will be donated to [insert charity], which they will sell at the silent auction at their annual [insert name of event where the wreaths will be sold]. Bring your friends and loved ones! This is a great girls' night or multi-generational family outing! Register at [insert website] or by calling [insert phone number] today to reserve your seat. Participation is limited to the first [insert number] of participants and is first-come-first-serve. Don't miss out! Sign up today! Of course, these sample messages might not be precisely right for the fundraiser with which you are involved. Use them as a starting point, consider these helpful invitation writing tips and create customized invitations specific to your event and audience. Be as clear as possible on what will be expected from each guest. Are you asking that they bring a canned good or a donation the night of the event? Always give details such as the event location, date and time. If possible, include directions in the invitation. Note any activities that will be part of the fundraiser such as an auction, dinner, raffle, etc. Give contact information in case there are questions and request that those attending RSVP so that you will know how many people to expect. Mention what charity is sponsoring the event and how the money raised will be used. Many organizations hold fundraisers during the holiday season, so you may have quite a bit of competition for participation and donations. To make sure that your invitation is not overlooked, be sure to use creative wording that will attract guests and bring in cash for your worthy cause!